BITSDIARIES about BEAUTY & ACNE: [Acne Story] #02: Update on My Acne Journey — "Breakouts"
So since my last update, my acne was actually healing pretty good until two weeks ago, which was the week before the "time of the month" .aka. period, my skin just suddenly broke out again. The breakouts were mainly on my left cheek and jawline and were kind of mild on my right. So here are the pictures taken on 12th March 2015. 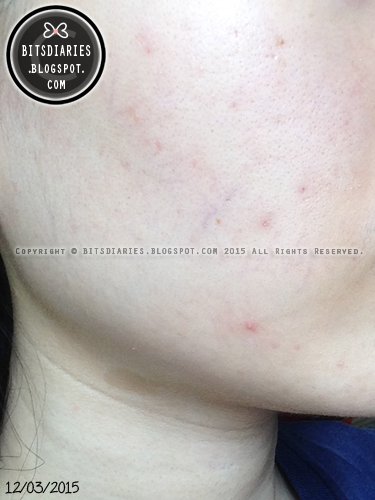 You can see from the pictures, there were post acne marks/scars; a few newly popped-out red inflamed zits on my left jawline near my chin area and one on my right jawline. On Monday (16th March 2015), all the zits that appeared on my face on 12th March were pretty much calmed down and healed. 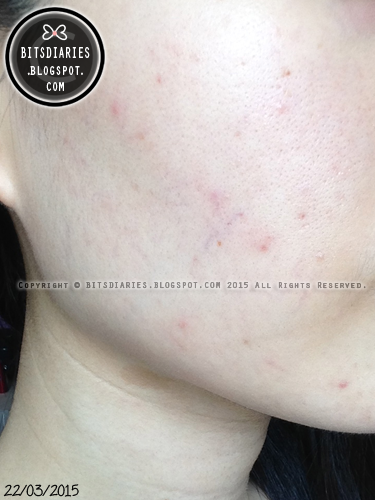 What's left were red-pink-brown post acne scars/marks. P/S: I prefer to treat one problem at a time so I'm currently putting my focus on acne. Some readers asked if I had undergone any facial treatment and honestly, NO. I have never done any facial treatment before even though I have been invited(sponsorships) by some salons to try out their treatments. I rejected them all~ So rest assured, my current acne story/journey consists of 0% facial treatments and medications, unless stated otherwise. It is treated only with skin care products that are appropriate to my skin type and condition and also some lifestyle changes such as healthier diets, routine etc.. Aside from that, take note that my past acne story/journey does not involve any medication and facial treatment, too. Just for some curious readers out there, the reason why I don't visit a dermatologist is because... I don't trust medicines. 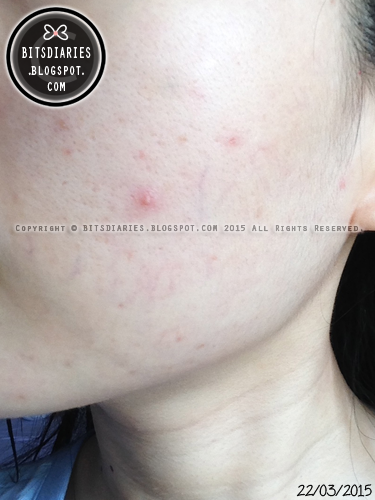 I have a friend whose acne condition is n-times worse than mine and she took medicines to control her acne. When her acne got used to the medicines, she will either increase the dosage or ask her doctor to prescribe even stronger medicines, which I don't think it's good for the body and health. Plus, the results were temporary. 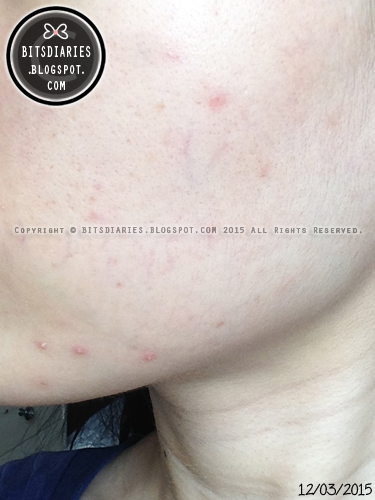 Once she stopped taking the medicines, her acne came back. So yeah, that's the reason why I say naaah to dermatologist. FYI, she's currently still dealing with acne but has stopped taking medicines. Side track: She's currently using Innisfree Jejubija Anti-Trouble skin care line and it works amazingly for her. So I'm going to switch to and try out that skin care line as well after I finish my current ones. In fact, I have already bought the products~ hehe~ Stay tuned for the reviews yeah~? Back on track...lol... as for the reason why I don't opt for facial treatments is because... I saw improvements on my skin from the use of skin care products and not to mention, they once healed my bad acne (Read My Acne Story). So I decided to keep my faith and continue to treat my acne with only skin care products. Furthermore, I think it might be helpful(e.g. give some hope) to people, who are struggling with acne and unable to afford or unwilling to undergo facial/laser treatment. Apart from that, many readers also asked if I sell products. In the past I don't, but soon I will! I'm currently still working on the website so be sure to check back for updates. The products I'm going to sell are basically items that I have tried and/or reviewed in my blog. Some are requested items by you readers over the years and up to present. Anyway, for any product request that you would like me to sell in my future store (online) and post request, drop me an email to bitsdiaries@live.com. For any question, you can ask at ask.fm/bitsdiaries.